Sustainable, eco-friendly and useful gardens are trending these days. Fruit shrubs and trees, herb and vegetable gardens, compost piles, bees, chickens and goats all produce something and earn their keep in exchange for their little piece of your yard. But of these increasingly common backyard inhabitants, bees might be the most interesting. Not only do bees offer big benefits, they actually need some things from us humans, right now. However, due to the whole “stinger issue” they’ve gotten sort of a bad rap. However, the truth about bees, their contribution and how you could benefit and help might surprise you. So, here are some facts, fictions and tips for anyone considering trying their hand at the role of Apiarist. First a little information about bees; Bees are both brilliant and absolutely necessary to life as we know it. With a complex social structure and method for communication within each hive, bees live in their own perfect order. As for communication, bees have their own special dance language for communicating the coordinates of pollen! Amazing. Additionally, bees are responsible for pollinating one third of our entire food supply, including things like apples, carrots and onions. However, since 2006 scientists have expressed growing concern about the mass disappearance and death of entire colonies of bees. This could have huge implications for our existing food system, and many point to the growing number of pesticides we are using on the majority of agriculture these days. This is why providing bees with chemical free places to continue the work they do is actually quite essential. In ancient times, honey was used as a poultice on wounds. Today, we understand that this worked because of it’s high antibacterial properties. Honey doesn’t go bad because bacteria can’t grow in it! Recently, archeologists found honey in a 2000 year old tomb, and the honey was still perfect, like the day it was made. This is, of course, provisional on honey being stored correctly. Honey can be used as a sweetener in most anything that regular white sugar is in, by simply replacing every 1 cup of sugar in your recipe with 3/4 cups of honey and then reducing the liquid in the recipe (water or milk etc) by 1/4 a cup for every 3/4 cup of honey. Not all honey is created equal. Most of the stuff you find in the regular grocery store has been “heated and treated”, which means that, like any other vegetable, many of the characteristics of honey which make it so healthful have been destroyed. Another reason for having your own hive; you’ll have your own crop of raw honey. So what would keeping bees for yourself look like? Well, they don’t require feeding in the traditional sense, or even much space. If you’re an aspiring apiarist, there are a few simple things to understand in order to get started. Before you actually get your bees, you need to have a few things. First, a bee suit, for you. While working with bees isn’t incredibly dangerous, it’s still just good practice to wear the bee suit, so you’re not agitated or distracted. You’ll also need a smoker, to calm your bees before working with them. Depending on what you have in mind, you’ll need to decide what type of hive you want. There are plenty of options out there, from the familiar white boxes, to a V-Frame. You could buy or build yourself. The same options apply for your frames, inside of which the bees will build their comb and lay their eggs. (Or sometimes you can buy pre-combed frames if you want to make things go a little faster.) There are lots of options, which can be explored online or even in person. Here’s a few local places with all the resources you could want. The Indiana Beekeepers Association and Central Beekeepers Association. The simplest way to get your bees is to order them, from either a local company or you can also have a queen shipped to you. If you’ve got a little more experience, a lot of fearlessness and a willingness to do a little reading/youtube-ing before you go, you can (theoretically) capture your own hive, out in the wild. But make sure you have a smoker and bee-suit! 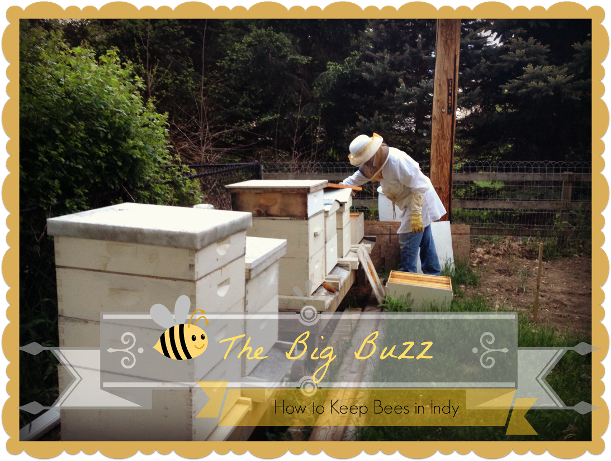 Put your hives near their food supply! This includes clover patches, honeysuckle, orange blossom, any fruit trees, and more. Do a little research about what plants and flowers bees like and make sure you’ve got that on hand for your bees or if not on your own property, that they have access to it somewhere near where you live. The nice thing about this is once you’ve got all of this planted and situated, it should largely care for itself, year after year. One other method would be to leave a portion of your yard to be reclaimed by the wild. This ‘non-planting’ for bees is effective. You’ll get wildflowers in your very own pocket meadow. Bees love meadows! However, if you live in a subdivision, make sure you’re not violating any codes by having a “wild patch.” Speaking of subdivisions, it’s usually a good idea to check with codes and even with neighbors when bringing in any addition like this. When you go to harvest your honey, there are lots of methods available. In fact, the harvesting process is probably a whole separate article. Just keep in mind that you’ll have to leave enough honey in the hive to feed the bees during the winter months, so you don’t get to claim every last drop of bounty. But bees which are happy and well fed will easily produce far more than they need, leaving you with gold to spare....which means gold to share (or sell, or save)! Get your bees in the Spring. They multiply in the warmth of summer, because summer is when they work, gathering nectar, and making honey. So, in summary, putting all of this together may take a little planning, and my best recommendation would be to start the Summer and Fall prior to when you’d like to actually have your bees, with setting up the feeding plants, hives and collecting your necessary supplies. If keeping bees isn’t for you, at least consider buying only raw honey from local honey producers, instead of the little bear on the big chain shelf. This helps support the folks that are working to save our pollinating little friends!